Stretch Armstrong and Bobbito “Kool Bob Love” Garcia have been hip-hop household names for a good twenty-five years, and now, those unlucky enough to have been born too late to grow up glued to Columbia University’s WKCR 89.9FM every Thursday night will be given access to the best “history of hip-hop in the 90s” documentary we’ve seen in quite some time. 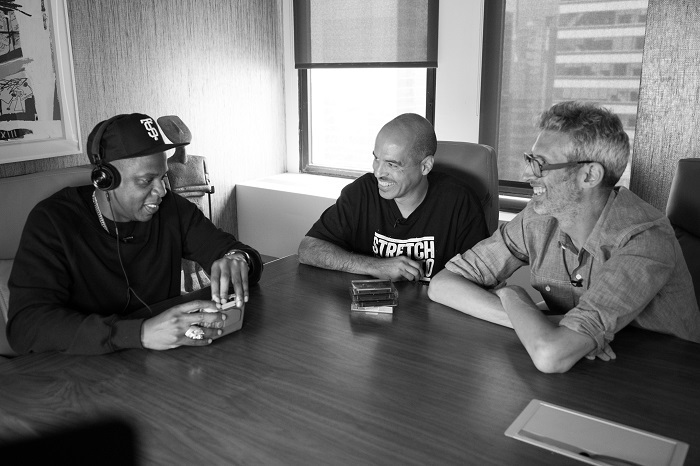 Directed by none other than Bobbito himself, the just over 90-minute film Stretch and Bobbito: Radio That Changed Lives highlights exclusive footage of the boys during hip-hop’s heyday, including interviews with some of the Golden Age’s finest like Nas, Busta Rhymes, Lord Sear, Jay-Z and “The Voice of New York” Angie Martinez. 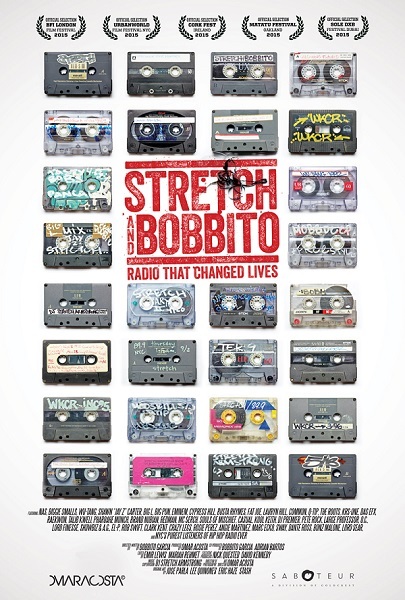 Every Thursday night for eight years, Stretch and Bob invited fans from across the globe into the studio during The Stretch Armstrong and Bobbito Show, and in the years since its inception, the total record sales for all artists who premiered on the show has exceeded 300 million. 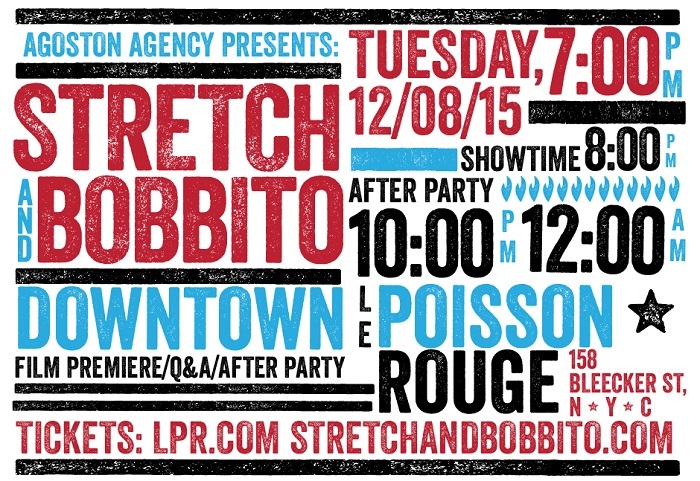 Next Tuesday, December 8, fans who were unable to grab tickets to earlier screenings can experience the Stretch and Bobbito: Radio That Changed Lives screening and Q & A session at (le) poisson rouge in NYC. As Bobbito will remind readers below: Don’t sleep. Tickets will sell out. Brooklyn Radio’s Lara Gamble got Stretch and Bob on the phone recently to discuss their early introduction to some of music’s most successful acts and personalities and learned what the guys have had going on in years since the show on WKCR went off the air. Bob: My earliest memory is 1977 when a member of the Zulu Nation who I was classmates with introduced me to the wonderful world of b-boying and rhyming. It was an instant gratification. The two of you met at the Def Jam offices and became fast friends, but what initially sparked the idea to start the show on WKCR? But it was a half-baked fantasy that quickly turned into reality when I found out that I could potentially get a show on the radio in New York City at WKCR. But it was a very short amount of time that it went from a fantasy to reality, and there was not a lot of forethought, or actually belief that this would actually happen until the opportunity presented itself. So it was more of a one-off kind of thing? In the film, Stretch and Bobbito: Radio That Changed Lives, you say that “in hip-hop, the DJ is the most important component.” Can you elaborate on that? Bob: You know, with the emergence of the culture on the music side, really it’s the DJ that’s the pivotal player. Everything kind of sponges off of that in terms of the dance and the rhyming. By the 80s, it seemed like the DJ sort of took a backdrop role, and the rap, the emcees, became the prominent characters in the movement. But, anybody who really knows and understands the culture and is part of it, they know the DJ is the most important part. That’s what makes everything rock. That’s what makes a good emcee an emcee. That’s why I let Stretch have his fun. That’s why he gets his PROPS. A voice-over during one of the interviews says you guys created your own internet before there was one. To what do you attribute that extended outreach? Bob: First of all, that was Talib Kweli who said that in the film. And he’s not the only person who said that in the interviews, but he said it so well that he’s the one that we went with on the quote. Stretch: I think it’s great that that’s the generation of artists that came up with us on our show in that way, which I think is accurate, but I think that same idea can be applied to and is true for other shows as well in New York, and I think you can argue that, you know, up until the advent of the internet, New York City was the center of the hip-hop universe. So, shows like ours that were unique that sort of compelled fans to listen to on a weekly basis, it was like a drug for these listeners. And while some really wanted to keep it their own personal secret, others were huge mouthpieces for the show and spread the gospel to their friends and contacts, whether that was family down south or out west or whether they were artists that travelled a lot. The word spread out. The same reason why some fourteen-year-old kid in Bushwick is gonna stay up all night on Thursday night and be too tired for school the next day, why wouldn’t some kid in Japan feel the same way? How did it feel to hear Nas tell you that your show was “the most important in the world,” and do you agree? Bob: When he said that, we didn’t put my reaction, but when he said that he wrote Illmatic while listening to our show, my reaction is on camera. I just throw my hands in the air. I might have fallen off my feet. A lot of people have said, over the years, that we had their favorite show or whatever, but for someone the caliber of Nas who’s in the realm of artistry and lyricism and his greatness to say that, it holds a heavier weight. So, we’re thankful for that and appreciative that he made the time to be on camera with us as well. What do you think kept the show running for eight years when the majority of the work was unpaid? Bob: I mean, you know, we were having a ball of fun up there and contributing to the matrix that was becoming an extremely important decade for, not just hip-hop, but for music. So, it was compelling to go back up there every single week up until it wasn’t…at which time we stopped. But for all those years where it was something to look forward to on a weekly basis, we were there. It didn’t matter that we weren’t getting paid. I mean, there was nothing else that was as much fun the whole week as doing the show. It was kinda like a no-brainer. What brought you both back for the 20th Anniversary show in October 2010? Stretch: That wasn’t the first reunion we had done. We had done others. The first one we did was very small at Table 50, and that would have been our 15? Bob: Table 50…yeah, 2005. So, that would have been the 15 year. Stretch: It gave us a little taste of what could be, and I think enough time had gone by that all of the less savory aspects of doing that show and whatever underlying acrimony that there had been when we split up had long dissipated. I think there wasn’t really that much thought that went into it. It was, obviously it’s a family thing, but it felt just sort of like a spontaneous thing in terms of the desire to do it, and doing it just really resonated with, and continues to resonate with, a young audience that wasn’t around then and the older audience that was there that perhaps feels a little bit left out of what’s going on in the hip-hop realm these days. When did the idea for the film come about? Bob: That happened in February 2014. I had already directed a film entitled Doin’ It In The Park: Pick-Up Basketball, NYC, which premiered on PBS, and a young producer by the name of Omar Acosta watched it, fell in love with it and hit me up to see what my next film would be. And in that conversation, he shared that he was a listener of the show, so that became like a natural next step. Like, “Okay, well, I love your work.” And I checked out his work, and yeah, we just decided to join forces and got Stretch got on board, of course. Couldn’t do a show without his blessing and involvement, and we released it in October 2015 to coincide with the 25th anniversary of our show, which started October 25, 1990. What’s been keeping you guys busy in years since? Stretch: Bob needs a half an hour. Bob: (Laughs.) Stretch, why don’t you start? Stretch: Well, I was DJing before the show, and I have continued to DJ since the show. I think at this point, it’s safe to say that I’ll be DJing for the rest of my life in some capacity. I wouldn’t say that I have a love/hate relationship with DJing. I think anyone in the creative field, any field, can relate to the idea that you love something so much that it goes from being a hobby or passion into a profession. When that happens, there are times when, I think, you wish it could feel like it did when you were just getting into it when it was just a hobby. So, there are certainly moments when I wish I didn’t need to DJ to make a living, but out of that, I try to make the gigs that I do not just ones that pay but also that don’t rob me of my soul. So, yeah, DJing is really the main thing, but I’ve been doing music supervision for film and TV. Primarily, I have been a DJ, and I’ve done some management, some A&R, freelance A&R, some consulting. But yeah, DJing. Now, I’ll let Bob take the next ten minutes to tell you about his various enterprises. Bob: I’ve been blessed that I’ve been able to really branch out and try a lot of different career paths, some of which have been extremely challenging. It’s allowed me to become a club DJ. At this point, I’ve spun in forty countries, six continents. But also, the relationships at the radio show put together a writing gig at Vibe Magazine. I wrote for that publication for ten years. I put out a book and since directed now two films, and I produce my own basketball tournament [Full Court 21] as well. A fan wanted me to ask, do you guys know if your mixes will be made available for purchase anytime in the future? And they sell out everywhere. Stretch: They’re pretty limited runs, and you probably could make the argument that we could press more, but we like to make them kind of exclusive and hard to get. Although, I can’t stand these motherfuckers that buy them just to resell them later, which is really annoying. Stretch: And records. It’s nothing new. I’m just saying. It doesn’t change how I feel. In terms of making our other shows or a part of or a lot of our archive available digitally, that’s something that I think people really want to see happen, and we would like to as well. But we’re not really sure how to tackle that. We’re looking at options. It won’t be for sale though. It’ll be free somehow if it ever happens. Bob: Yes. We have a screening at (le) poisson rouge, Bleecker Street, December 8. Yeah, December 8. I just bought a ticket. Bob: Oh, you did. Cool, thank you. Word to the wise, we’ve been destroying box offices all over the world. So, to the readers, don’t wait until the last minute and be on the scramble. We had a screening at Brooklyn Historical Society, which we barely promoted, and it sold out. All the links that you sent me, I’m happy to include with the interview. Bob: Whoomp, there it is. Alright, cool. Thank you.